From here, click the blue “Connect” button under the data source icon to connect to it. Each network has it's own way of integrating with NinjaCat. Please refer to the guide below for instructions on how to add your selected network. Under the Clients tab, Action - Client Settings, connect your client’s account with the correct Ad Roll network under the Ad Roll heading. From the drop-down menu Add to Ad Roll Network, select the Ad Roll network for this client. Under the heading Ad Roll Advertiser, select the account for this client. Click Update Settings to confirm your changes. Once you have clicked on the Add Network button in your Networks tab and selected Bing Ads, click on the Add Network Account button. A second tab or window will open up in your browser taking you to your Yahoo/Bing log in page. Type in your Microsoft username and password for your Bing Ads account. Once logged in this will establish a token between your Bing Ads account and NinjaCat. Repeat these steps for each Bing Ads account you need to connect. Please note if you are creating multiple networks for multiple Bing Ads accounts, please use the Description box in the Add Network page of NinjaCat to note which Bing Ads account you are adding. This way you can identify the correct Bing Ads account to tie to your clients later on. Once you have clicked on the Add Network button in your Networks tab and selected Google AdWords, click on the Add Network Account button. Copy and paste your API Key to your NinjaCat Networks tab where your Call Rail account is located and click "Save". Once you have clicked on the Add Network button in your Networks tab and selected CallSource, click on the Add Network Account button. You will see in the Password/Tokens column of your NinjaCat Networks tab that your CallSource network requires a Username and Password. These credentials are your CallSource Username/Account ID and Password to your CallSource account. Type in your credentials and click "Save". Once you have clicked on the Add Network button in your Networks tab and selected CallTrackingMetrics, click on the Add Network Account button. You'll see the API Integration box towards the bottom of your screen. In the API Integration box, you'll find your API Access Key and Secret Key. Copy and paste your API Access Key and Secret Key into the designated areas under the Password/Tokens column of your NinjaCat Networks tab and click "Save". Advertiser ID, Client ID and Client Secret Key. Click the Add Network Account button to save yourchanges. Once you have clicked on the Add Network button in your Networks tab and selected Century Interactive, click on the Add Network Account butto. Century Interactive requires you to provide your API access account username and password to NinjaCat for integration. You must contact Century Interactive for an API access account. Your API access account is a different username and password than your log in credentials to Century Interactive. When you contact Century Interactive, ask for your API access account and then forward us your API access ID. You can forward your API access ID by clicking on the Support button in your NinjaCat account. Once NinjaCat receives your credentials we can connect your Century Interactive account. Once you have clicked on the Add Network button in your Networks tab and selected Facebook, click on the Add Network Account button. A second tab or window will open up in your browser taking you to your Facebook Ads authorization page where you can type in your Facebook Ads username and password which will grant NinjaCat access to your account. Repeat these steps for each Facebook account you need to connect. Please note if you are creating multiple networks for multiple Facebook Ads accounts, please use the Description box in the Add Network page of NinjaCat to note which Facebook account you are adding. This way you can identify the correct Facebook account to tie to your clients later on. You will see your new Google AdWords network listed in your Networks tab. In the same browser your are currently in, open a second tab and log into your Google AdWords account. We recommend you have your Google AdWords account tied to an MCC if you have multiple clients with Google AdWords accounts. Please refer to the link here if you have not set up your MCC https://security.google.com/settings/security/permissions. With NinjaCat opened in 1 tab of your browser and Google AdWords opened in a second tab, go back to your NinjaCat account and click the Create button next to your new Google AdWords network in the Networks tab. This will establish a token between your opened Google AdWords account and NinjaCat. In the Google AdWords tab of your browser, you will be prompted to grant NinjaCat access. Click Accept. You should then see a token fill the Password/Tokens column of your NinjaCat account's Networks tab where your Google AdWords network is located. Once you have clicked on the Add Network button in your Networks tab and selected Google Analytics, click on the Add Network Account button. You will see your new Google Analytics network listed in your Networks tab. In the same browser your are currently in, open a second tab and log into your Google Analytics account. With NinjaCat opened in 1 tab of your browser and Google Analytics opened in a second tab, go back to your NinjaCat account and click the Create button next to your new Google Analytics network in the Networks tab. This will establish a token between your opened Google Analytics account and NinjaCat. In the Google Analytics tab of your browser, you will be prompted to grant NinjaCat access. Click Accept. You should then see a token fill the Password/Tokens column of your NinjaCat account's Networks tab where your Google Analytics network is located. Repeat these steps for each Google Analytics account you need to connect. Please note if you are creating multiple networks for multiple Google Analytics accounts, please use the Description box in the Add Network page of NinjaCat to note which Google Analytics account you are adding. This way you can identify the correct Google Analytics account to tie to your clients later. Under the client settings, select Actions --> Manage Client --> Google Plus Settings, enter a search keyword to search for the business name. Enter in the zip code or postal code of the business (no spaces). Click "search" button to find your business. Select a business from the drop-down list under "Yelp Account" then click "Update Client" below. Access the setup menu in the upper righthand corner by clicking the dropdown menu under your name and selecting "SETUP". Under the "data sources" tab, select "ADD NETWORK" on the right side. Search for "Google My Business" and click "CONNECT"
Google will prompt you to select an account and then allow permissions, select "ALLOW"
Once your Google My Business network is connected you have the option to connect that network to an individual account. 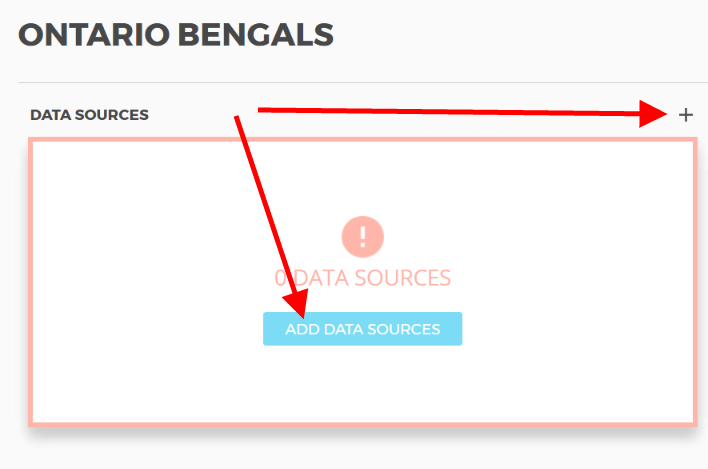 From the account screen, select the "+" symbol above the list existing data sources. Select the same "Google My Business" icon and select "CONNECT"
Once you have clicked on the Add Network button in your Networks tab and selected Google Sheets. Type a unique description to name this sheets connection. Open another tab in the same browser and log in to the Google Drive/Sheets account you wish to connect. Clicking the add Networks button will automatically direct you to select the Google account you wish to grant access to. Select the Google account to grant access. Follow these directions from HubSpot to create and copy your API token. Click on your name in the top-right corner of NinjaCat, then select Setup -> Data Sources -> Add Network. Give your HubSpot connection a unique name or Description, then enter your Username and paste in the API token from Step 1 above. Click on the Accounts tab, and click on into the account for which you just added HubSpot. You will need to add a separate HubSpot data source and network at both the Agency and Advertiser level in order to connect HubSpot data. Login to the DialogTech Portal. Navigate to Developer Tools -> Building Block IDs. To generate your new key, click ‘Generate Key’ located in the top left of the Access Key Manager. The next window contains both an ‘Access Key’ and a ‘Secret Key’. Make sure to copy both keys and save them somewhere safe. You will require both of the keys within NInjaCat. Once the window is closed, you will not be able to access your Secret Key again. Log into your NinjaCat account (myppcreports.com). Navigate to the 'Networks' tab and find your current ifbyphone network. Type or copy-and-paste your username / account ID and password for Infinity call tracking in the space provided. Click on the "Add Network Button". Click on your name in the top-right corner, then enter Setup - Data Sources - click on "Add Network" and click "connect" under the Mailchimp logo. Enter in your username and API token that was generated from Step 1. Once you have clicked on the Add Network button in your Networks tab and selected Marchex/VoiceStar, click on the Add Network Account button. Marchex/VoiceStar requires you to provide your Marchex/VoiceStar account username and password to NinjaCat for integration. Type your Marchex/VoiceStar username and password into the designated areas under the Password/Tokens column of your NinjaCat Networks tab and click "Save". Once you have clicked on the Add Network button in your Networks tab and selected Mongoose, click on the Add Network Account button. Once you have clicked on the Add Network button in your Networks tab and selected Navis, click on the Add Network Account button. You will need an account ID and password for each client in your Navis account. If you have multiple clients in your Navis account, you must create a separate Navis network for each client in NinjaCat. Please contact Navis for your account ID and password for your clients' credentials. Once you have obtained your account ID and password for each client in your Navis account, click on the Add Network button and create a Navis network for each client. f plan on utilizing more than one Navis network account for your agency, you can help eliminate confusion by placing your client's Navis username in the description field of your NinjaCat network profile for each Navis account. Type or copy and paste your client's account ID and password for each Navis network account in your NinjaCat account's Networks tab and click "Save" next to each account. Once you have clicked on the Add Network button in your Networks tab and selected Response Tap. You will need your Username/Account ID and password. 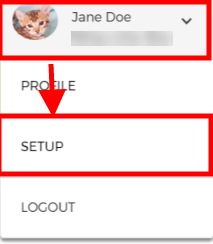 Once you have obtained your Username/Account ID and password, type or copy and paste your Response Tap Username/Account ID into the designated area of your NinjaCat Networks Tab and click the "Save" button next to your Response Tap network profile. Once you have clicked on the Add Network button in your Networks tab and selected TruMeasure, click on the Add Network Account button. You will need your Username/Account ID as well as your TrueMeasure API Token. To obtain your TruMeasure API Token, contact TruMeasure support at support@trumeasure.com and ask for your API Token credentials for integration with NInjaCat. Once you have obtained your API Token from TruMeasure support, type or copy and paste your TruMeasure Username/Account ID and API Token into the designated area of your NinjaCat Networks Tab and click the "Save" button next to your TruMeasure network profile. Click on the Add Network button in your Networks tab and select "Twitter" from the drop-down menu. Fill in a descriptive name for the twitter account you will be adding (Example: "Twitter Agency/Advertiser Name"). This will help you to identify each twitter network in your account if you need to make changes later on. Click on the "Add Network Account" button. You will be automatically redirectd to a page where you will log in to your Twitter account in order to make the connection. Under client screen, select Actions --> Manage Client --> Twitter Settings. Select your newly added twitter network from the Ads Network drop-down list. Select the client's account from the Twitter Ads Account drop-down list. Click "Update Client" below to save your changes. Clicked on the Add Network button in your Networks tab and select Verve from the drop-down list. Once you have obtained your API Key, type or copy and paste your Verve API Key / Token into the designated area and click the "Add Network Account" button. In the same browser your are currently in, open a second tab and log into your Yahoo Gemini account. Once you have clicked on the Add Network button in your Networks tab and selected Yahoo Gemini, click on the Add Network Account button. You will be brought to a second tab to either log in to Yahoo Gemini account or to give approval for Ninjacat to access Yahoo Gemini. Follow the steps given to grant permission for NinjaCat to access your Yahoo Gemini account details. Once logged in this will establish a token between your Yahoo Gemini account and NinjaCat. Under the client settings, select Actions --> Manage Client --> Yelp Reviews, type a search keyword to search for the business. Click on your name in the top-right corner of NinjaCat, then click Setup - Data Sources - Add Network. Click Connect under the Yext icon. Go back to the NinjaCat tab, type in a unique name for your Yext Network under the description field, then click Add Network. Click "Approve" to grant NinjaCat permission to your Yext data to complete the connection.